A white high school senior, unsure of whom to trust, navigates romance and secrets in Collins’ (Until We Meet Again, 2015, etc.) third novel. After her involvement in a devastating car accident during junior year, Shelby’s anxiety and panic attacks became so severe that she entered a clinical program for “neural restructuring”—a combination of “brain stimulation” and hypnosis—to wipe her most painful memories. Both she and her mom are ready for her life to settle back to normal, complete with auditions for the lead role of Juliet in the school play. Yet although she has no memory of the accident, Shelby can’t shake the feeling that something isn’t right. 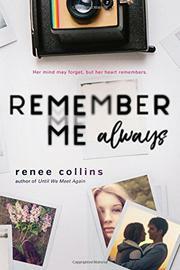 Little, unpredictable triggers still spike her anxiety, and there’s a boy—a boy named Auden who claims not only that she knows him, but that they are in love and that the doctors wiped her memories of him too at her mother’s request. Drawn to him, Shelby must decide whether she will trust him and secretly explore this old-but-new relationship or whether something feels wrong there, too. Shelby’s best friend’s escape from an emotionally abusive relationship leads both characters and readers to question the health of Shelby’s relationship with Auden, whose power in their relationship frequently wavers over the line of abusive. Shelby’s first-person narration sets up readers to discover the truth as Shelby does, but her present-tense voice is so bland it undercuts the tension, and readers will find the plot easy to predict.